Environmental Protection Agency (EPA) administrator Gina McCarthy will attend an "environmental justice" Broccoli festival that features performances by Willow and Jaden Smith, who do not believe in school or the concept of time. 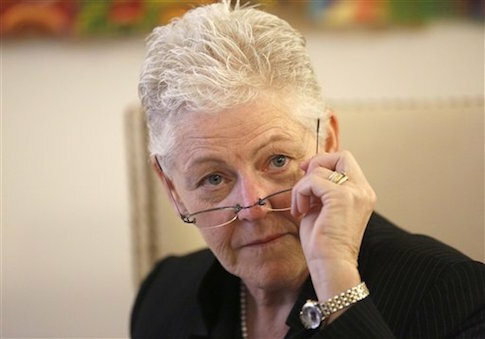 "On Saturday, April 25, EPA Administrator Gina McCarthy will give remarks at the Third Annual Broccoli City Festival's Earth Day celebration," an EPA press release stated. "Administrator McCarthy will speak about EPA's efforts to implement President Obama's Climate Action Plan by building more resilient communities and curbing the carbon pollution fueling climate change through its proposed Clean Power Plan." The EPA said the third annual festival, which will take place in Southeast Washington from noon to 9 P.M., has a "tradition of bringing together policy makers, business leaders, acclaimed musicians and community stakeholders to highlight solutions to environmental challenges." "At the core of EPA’s mission is an unwavering pursuit of environmental justice," the EPA added. "Too often, America’s low-income and minority communities bear the brunt of our country’s pollution, so EPA is taking historic action to fight the economic and public health risks of a changing climate by cutting carbon pollution from power plants because pollution and climate impacts are a barrier to economic opportunity, blocking the path to middle-class security." The music and art festival, which is aimed at improving the lives of low-income communities, is charging $45 for admission. It is hosted by Broccoli City, a "lifestyle group" that plants community gardens and offers healthy food classes to urban neighborhoods. The group is promoting this year’s event with performances by Willow and Jaden Smith, the 14 and 16-year-old children of Obama donor and Scientologist Will Smith. Willow and Jaden are not big fans of education, according to an interview they gave to T Magazine last year. "You never learn anything in school," said Jaden, while Willow added she only went to school for one year. Willow believes the "concept of time" does not exist, and that books are useless, so she writes her own. Jaden is a "free spirit" who wears dresses, skirts, floral headbands, and other "feminine frocks because it makes a ‘high-end fashion statement.’"
That Moment When Peeing Feels So Good You Start Crying. Existence is a game that never ends but is always beginning. The Broccoli City festival is held in honor of Earth Day, and uses a logo of a clenched fist raised to the air, a symbol commonly used by Leftist political movements, only holding a piece of broccoli. Aside from performances by the Smith kids, the festival will also feature Brooklyn rapper "Joey Bada$$" and "lowbrow" art. "General admission includes access to live musical performances, yoga and fitness instruction, food vendors, body wellness center, live art gallery, educational information, pop-up marketplace, and more," the event’s website states. The event will also include food from Whole Foods, a "full-service organic juice bar," and an "acupuncture and massage center." The festival emphasizes living a "lower carbon lifestyle," provides only compostable utensils, and encourages attendees to take public transportation to the event. Broccoli City argues "it takes a village" to ensure "food and environmental justice." "We believe a healthy Earth starts with a healthy community," the organization states on its website. "To ensure we reach our community wellness goals, we focus on food and environmental justice, social health education, and physical activities." "Understanding that it truly takes a village to effect change, we set out to establish strong relationships with non-profit organizations, social influencers, government entities, corporations and learning institutions," they said. Broccoli City claims that seven percent of Americans live in "food deserts" and that "White neighborhoods have on average 4 times as many supermarkets as predominantly Black and Hispanic ones do." The organization also builds "micro communities" for millennials, and "creative habitats" made out of re-purposed shipping containers for low-income communities in D.C. and Los Angeles. Broccoli City is partnered with the Washington, D.C., District Department of the Environment, who says the festival attempts to "make living healthy and more sustainably ‘cool’ in the urban community." This entry was posted in Issues and tagged Climate Change, EPA, Gina McCarthy. Bookmark the permalink.